1) To be French, you really shouldn’t work. Don’t work past 5. Don’t work during a strike. Definitely don’t work at lunchtime, because lunch requires at least 1.5 hours if you are to do it properly, in the French tradition. And there will be hellfire if anyone breaks French tradition. Try not to work around 3pm, so you can have a cafe at the bar and read the paper. In fact, try not to work between 1-4, so you can properly fit in time for lunch and the cafe. Je voudrais (whatever it is you want) followed by s’il vous plait. And always, always, always, say Bonjour, Bon Soir and Merci, and Pardon, not excuse me. 3) Eat baguettes and croissants as much as you want, whenever you want. It doesn’t matter. You don’t gain weight if you are within French borders*. 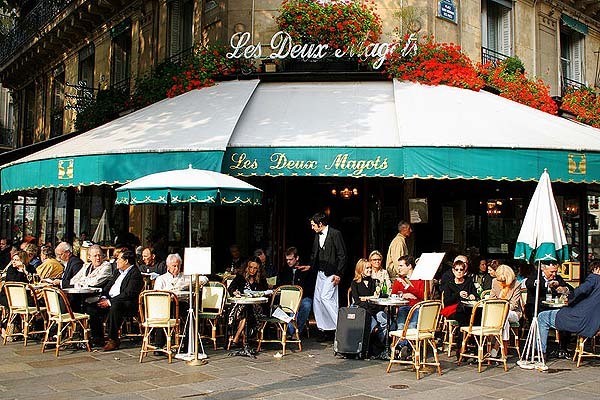 Boulangeries and patisseries are as commonplace as Starbucks in Manhattan. It is expected. Upon buying a baguette to bring home, automatically break off the top piece and eat it, to make sure it’s edible. 4) Sitting at a cafe for an hour and only drinking a Coca-Cola Light is fine. Maybe even encouraged. Oh and that green drink? Not absinthe. It’s a minty syrup water thing. Very refreshing, apparently. Upon further research I hope to answer why Coca-Cola Light tastes so much better than Diet Coke. But I really like that it’s served in a glass bottle, with a glass of ice, a round of lemon, and a tall spoon for stirring it as if it is a cocktail. 5) Horse butcher shops. Yes, they eat horse meat. To be further assessed when I show you all the fun pictures from the local butcher shop. 7) Don’t work, but try to make a lot of money. Living in Paris is expensive. Buying fresh produce and fresh meat and fresh cheese and fresh milk and fresh baked baguette is going to cost you. You can spend a $100 euros at the market for ONE MEAL. Getting a second job is out of the question, but perhaps the French people can figure out a reason to strike for more money. 8) Take the bus. You live in Paris, it’s one of the most spectacularly beautiful cities in the world, with more architectural eye-candy than should be alloted to one place. Why the hell would you go underground? Who cares if the bus takes longer. When your ride takes you through the Place de la Concorde, over the Seine, past Les Invalides and St. Sulpice, you’ve basically just taken a city tour for $1.80 euro. 9) Eat eclairs on the street. It feels SO GOOD. 10) Take plant pills. You’re going to be eating alot, and the food is rich, and can occasionally make you feel like a dead weight of lard. Oddibil is saving my life.